Offering business intelligence services, product maintenance services, supply chain services etc. Also deals in retail driver. In an increasingly global market, RFID applications present unprecedented opportunities for product suppliers to overcome supply-chain challenges that have accompanied the growth of inter-regional and global trade. Manufacturers, suppliers, End Users, shipping companies and solution providers have spent decades inventing ways to understand where products are as they move through the supply chain. The goals have been to maximize availability -- and create a greater selling opportunity -- while maintaining the lowest amount of product in stock. Radio frequency identification (RFID) can help businesses improve their bottom line and gain control over business processes through improved visibility, increased efficiency, and enhanced productivity. As companies move past initial pilots and single-site deployments, they need an infrastructure that can easily be deployed and administered, support high-volume data management, and integrate into enterprise business systems. 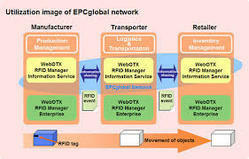 Extenprise RFID middleware platform is a critical RFID infrastructure component that integrates the edge of the network with enterprise application systems. It helps enable safe, secure, and highly efficient supply chains by supporting applications that address asset tracking, counterfeiting, tampering, and compliance, among others. In addition to managing the large number of RFID devices and other sensors in an enterprise deployment, RFID Software can also aggregate and process volumes of RFID data into business events at the edge - thereby enabling faster decision. Monitoring and Management : Administration Console allows monitoring and managing large number of readers. Integrating Data with the Enterprise : Application Programming Interface (API) ensures integration with existing enterprise tools and applications, including warehouse management, supply chain management systems, and ERP applications. Receive and process RFID tag data with a powerful Application Level Events (ALE) processing engine. Edge Servers then provide interpreted RFID tag data to the enterprise applications that require it. Provide real-time reader activity (telemetry data) to a centralized Administration Console, which gives the ability to monitor and manage the RFID infrastructure quickly and centrally. On average businesses lose between 15%-35% of its customers annually. In addition, seventy percent of customer defections are due to poor sales or service interaction with the customer. The cost of acquisition of a new customer is much higher than cost of customer retention. Given this, Customer Relationship Management (CRM) is increasingly becoming a central strategic success factor for companies, cutting costs, on the one hand, because it optimizes customer-centered workflows and boosting profits on the other, as the value potential of customers and prospects can be exploited to the full. Adopting the CRM, solution offered by Enterprise, you could transform your company into a high-performance business that is equipped to meet the challenges of the current market places. It allows clients to assess individual customer service levels and compare it with Cost To Serve, to identify both under-served as well as over-served customers, and therefore drive increased customer service as well as profitability. It requires definition of various product-customer segments of an organization as well as identification of current service levels, target service levels, as well as Best-in-Class service levels. It then allows for integration of Order Fulfillment processes to measure customer service levels and cost to serve. Top line growth is the single most important item in most executive's agenda. Current options, like increased hiring of sales staff, take time to build and deploy, and may not be fully effective in the near-term. Enterprise's integrated MarketDriver™ solution allows clients to rapidly and cost effectively increase sales capacity and revenues through deployment of offshore sales support process teams with relevant industry and product experience and supported by CRM/SFA and middleware software. MarketDriver™ is a complete solution with proprietary review and diagnostics tool, set of processes and tools enabled through a robust software platform and staffed by skilled Enterprise business and technical consultants. "Out of stock" status or a high inventory" situation is a huge industry problem. This happens as all partners in the supply chain work in isolation, there are no coordinated inputs from the other supply chain partners (e.g. distribution centers, manufacturing plants etc.) Hence, partners end up developing their own best forecasts without considering the other parameters in the supply chain.In an age of intense competition, supply chain efficiency is must for success. Today's supply chain networks are complex and multifaceted. To manage them successfully, organizations must monitor countless interlocking activities and keep all of the partners in the network moving in concert toward a common goal. Extenprise Supply Chain solutions help organizations to meet these challenges with comprehensive capabilities for supply chain coordination. With Extenprise Supply chain Solutions, organizations can align and synchronize operations with suppliers, partners, and customers to manage supply chain events and monitor performance, ensuring that every process in your adaptive supply chain network is efficient, effective, and operating as planned. It allows organizations to access the knowledge and resources of the peers, adjust intelligently to changing market conditions, and remain customer-focused. In an increasingly global market, RFID applications present unprecedented opportunities for product suppliers to overcome supply-chain challenges that have accompanied the growth of inter-regional and global trade. Manufacturers, suppliers, End Users, shipping companies and solution providers have spent decades inventing ways to understand where products are as they move through the supply chain. The goals have been to maximize availability -- and create a greater selling opportunity -- while maintaining the lowest amount of product in stock.Radio frequency identification (RFID) can help businesses improve their bottom line and gain control over business processes through improved visibility, increased efficiency, and enhanced productivity. As companies move past initial pilots and single-site deployments, they need an infrastructure that can easily be deployed and administered, support high-volume data management, and integrate into enterprise business systems. Business Intelligence is paraphernalia for business analysis, which includes gathering, storing, analyzing, and reporting the enterprise-level data to help enterprise users make better business decisions. Extenprise XML - IDE; (XML Integrated Development Environment) platform facilitates business analysts to define, develop and deploy new applications rapidly.XML - IDE removes the inefficiencies in the current processes where the biggest discontinuities are in manual translation of business requirements into IT requirements, which entails significant time, money as well as quality costs. In addition, the current process of developing new applications require system integrators to have significant business process capability or business process designers and analysts to have significant IT capabilities, and typically both are found wanting in what happens to be two very different core competencies.XML - IDE significantly reduces the time and effort in development and deployment of new applications as well as application-to-application integration. 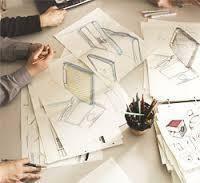 In addition, it does not require significant IT expertise to design or implement such solutions. This leads to significant reduction in costs for enterprises looking to integrate disparate systems or develop new applications on their existing Enterprise systems and other legacy systems. Such non-programmatic ways of building applications based on deploying underlying standard object blocks is likely to be the way of the future, and is likely to significantly change the way many enterprise applications are developed and deployed. Committed to deliver innovation, Enterprise collaborates with its customers to help them achieve high performance. We provide strategic and business planning, project management, implementation assistance, and technology expertise to our customers. Our highly experienced industry consultants leverage leading edge technologies and tools to identify new opportunities and drive business process improvements.We assist customers in integrating their People / Organization with the Processes /decision making and information flow rules and Documents, which are both a part of decision-making process or a result of the business process. Through a comprehensive set of services, we ensure that critical success factors are in place for customers so as to ensure maximum benefit. Extenprise offers independent verification & validation (V&V) services spanning the entire product release lifecycle. This includes formulating test strategy, test planning, execution, and defect analysis & risk assessment. Extenprise team would work very closely with the development teams to understand and validate requirements and come up with a high level test strategy that would include scope of testing, types of testing required, test environment requirements, key milestones, defect management plan etc. This would be followed by detailed test plan that would include effort estimation, timelines, resource loading etc. After unit testing by development team, the V&V team will apply certain criteria as defined in the test strategy before accepting the load for further testing. Extenprise has a well-defined and mature process. We offer IT services using our time tested Global Delivery Model. Extenprise has a well-defined and mature application development process, which comprises the complete SDLC from business case analysis to warranty support of the application. This process supports a distributed delivery environment wherein work responsibilities are effectively divided between various delivery teams spread across different geographies. Roles and responsibilities of customer team and our team are clearly defined. We can also work with development team of customer and help them develop application. Each of the development phases can be defined with deliverables and subsequently tracked jointly by customer and us. Extenprise has a well-defined and mature application maintenance process, which allows effective capture, reporting resolution of maintenance requests. This process supports a distributed delivery environment wherein work responsibilities are effectively divided between various maintenance teams spread across different geographies. Roles and responsibilities of customer team and our team are clearly defined. We can also work with maintenance team of customer and help them maintain application. Extenprise has extensive experience in software product development. This experience is gained through our own technology products. Extenprise can help product companies to conceptualize the product. This would involve deciding on the product features, deciding on tools for development, development methodology/strategy, scope of the product, creating development work plan, deciding platform support etc. Extenprise can help product companies to position the product. This would involve consulting on market research, targeting certain sector, writing technology/solutions white papers, comparative study of the competitor's product, SWOT analysis etc. Extenprise can help product companies in streamlining their release management process. This would involve studying current release management process, identifying bottlenecks, defining release calendar, calibrating configuration management process, defining release management process etc. Extenprise has a well-defined and mature product maintenance process, which allows effective capture, reporting resolution of maintenance requests. This process supports a distributed delivery environment wherein work responsibilities are effectively divided between various maintenance teams spread across different geographies. Roles and responsibilities of customer team and our team are clearly defined. Throughout the project, test progress and productivity reports will be generated to monitor the schedules, quality and risk. Faced with constant time to market pressures and the ever-increasing demands on the quality front, companies are on the look out for ways and means to improve testing productivity without compromising on coverage. Hence automation of test suites assumes great importance in the IT and product industries. However, despite the myriad of tools available in the market, this is easier said than done. Firstly, it is important to set clear business goals for automation and work towards creating a detailed automation strategy and plan. Secondly, it is also important to conduct feasibility & viability study that helps in understanding how much automation can be done and whether it is worth doing the same or not by computing the RoI. Last but not the least; a tool selection exercise needs to be carried out followed by a proof of concept of the selected tool. Extenprise offers certification services for various software products (applications). The certification indicates that a third party software product provides all the features as outlined in the certification guidelines provided by the software vendor. The objective of certification testing is to make sure that products (applications) developed by ISVs have full functionality, that the certification requirements are met and that the product is not generating frequent faults or system crashes. This testing, however, would not constitute a "quality assurance" seal and would not imply that the product is bug- free. Extenprise will 'certify' third party products/applications based on various benchmarks as decided by the software major. This certification will ensure that the applications developed by ISVs are fully functional on software vendor's hardware and software platform. Radiology Server helps to control the resources in an enterprise level for all Dicom based modalities and automates a significant portion of a clinical radiologist's work, which leads to improved satisfaction for patients and referring physician.Radiology Server helps hospitals and radiologists to create, edit and verify reports on a real-time basis. These reports are then delivered to referring physicians using either the internet or telephone. It provides easy to access online medical reference information. With the help of this application, the accurate and complete billing data is created during the report creation time. The application provides alerts of upcoming events to radiologists This application helps to improve the productivity of busy practicing clinical radiologists by automating a large portion of their workflow and implementing it in an easily mastered software application.